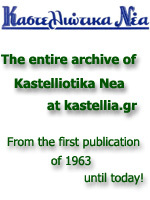 We are welcoming you to the "Kastellia" Portal! Feel free to navigate through the Portal's pages and if our village is not known to you, find out where it lies, how to get there, what its history is and all the wonderful things it has to offer. You can go skiing to mount "Parnassos", hiking all around the area, take a drive to the magical "Delphi", stroll down the cosmopolitan village of "Arachova", visit the historical village of "Gravia" and be a part of the spectacular "Rally of Greece" (former "Rally Acropolis"). If you are affilated with "Kastellia", then you will discover that this Portal has been designed to become a warm and friendly web space targeted to connect and provide information and other resources to the whole village community. You can revoke old memories through the pictures and sounds section and express your opinion in the "Forum". You can also read all kinds of stories in the "Nostalgic Stories" area. Stories which are funny, spicy, stories from childhood memories, stories written from life in the village. You can also find contact information for people related with Kastellia as well as for their businesses. If also for some reason you are not getting a printed version of the newspaper from our village, "Kastelliotika Nea", you can find it in the Portal. 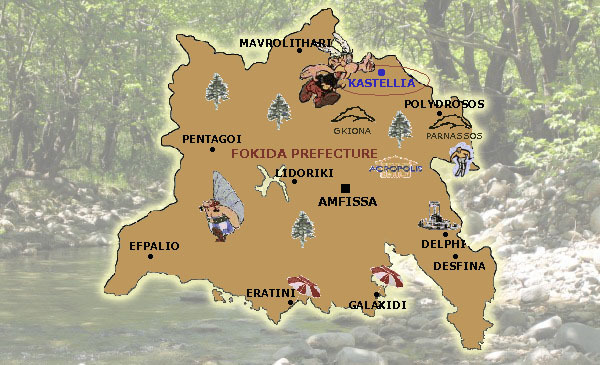 Finally, as a gesture coming from our endless love for our village, we are offering the opportunity to acquire an email address of your choice @kastellia.gr for all people affiliated with "Kastellia" absolutely for FREE (the only requirement is that you have some association with "Kastellia"). In order for you to receive the free email address and in order for you also to gain access to the Telephone and Business directory sections, you first have to register to the "Kastellia" Portal.